It's very pleasant to negotiate with real people in real life without screen and keyboard inter-faced, I must say! Some basics: three piece mahogany body, center block plus two "wings", an ultra-rigid laminated set neck, fat and round (about twenty layers or so) like some older German archtops (Höfner, Hopf or Hoyer? ); the original, Hoyer-branded, low-output single-coil pickups which look like Humbuckers have been replaced by some no-name doublebobbins, one volume, a pot to influence the lower frequencies, another one for the higher tones. The switch (very flimsy on top, good mecanically underneath) does neck, bridge and both out-of-phase (very useful for a full-throttle Hardrock axe ridden at 11 - but it does the softer, bluesier or jazzier range as well with the neck pickup and pots rolled back). I'll get her some decent pickups one day (Gibson '57, without the + ?). Easy to service; just loosen the strings, unscrew the block which holds them, swing it away and you do whatever is necessary to her. Ah yes, tuners are Schallers, not original. I love it, sounds great and I don't want to sell it. When started [playing guitar] about the age of 14/16 there were Flying Vs or Arrows all over the town, every shop had them, cause I used to live in Hanover, Germany and Scorpions played Vs, at least the Schenkers did. 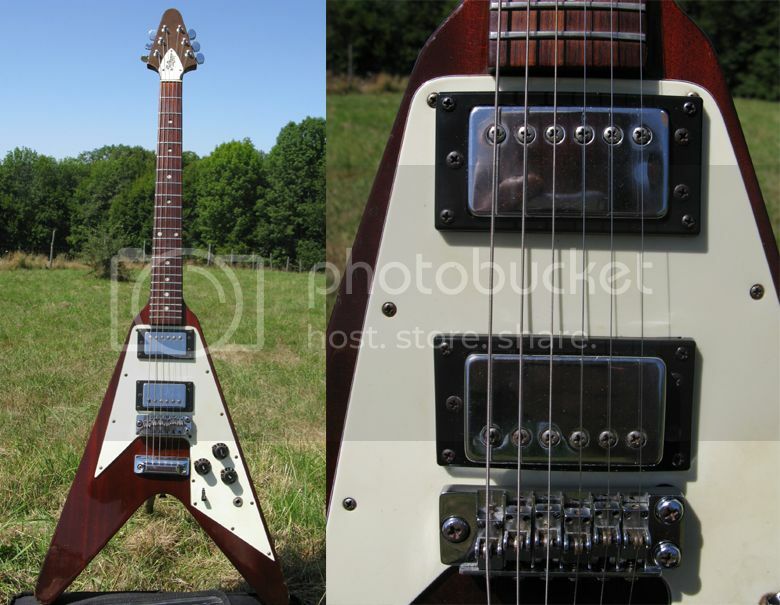 So we flatenned our noses on windows and put our paws on some of these Vs, but never on a Gibson (always protected by "Please don't touch" or "Ask a seller" notes) and by that time the Flying Arrows had a very good reputation as a Gibson V Killer (the Humbucker versions!) and we were allowed to touch them! If you're a poser, you'll need the right logo. If you're a player looking for the advantages of these guitars, accepting the inconveniences, a Hoyer Flying Arrow will satisfy you for a lot less money. It's a 40 year old mahogany girl with an undestroyable neck, made in Germany and not thrown together from Asian prefrabrics. Just two things: if anybody knows how to get the fretboard dots back up (they've sunk in theirs slots !) I'd be happy to learn about that. Second thing, if anybody knows about a 5069 S (neck-through, string-through, last version of it) for sale, I'd be more than very interested! 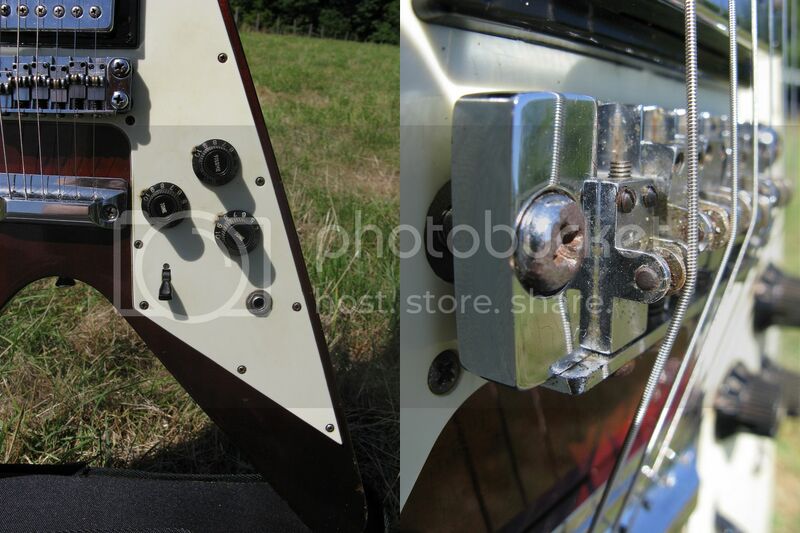 I'd even be interested in a 5069 S woodwork, just the body and the neck... all offers are way more than welcome. Dirk can be contacted via Guitarz - we will pass any messages on to him. You could call it a "roller enabled" bridge but I agree, not a roller ( as is ) in the truest sense. Definitely "engineered for stout!". The oversized trussrod cover is downright regal, love it. Was that the orig. 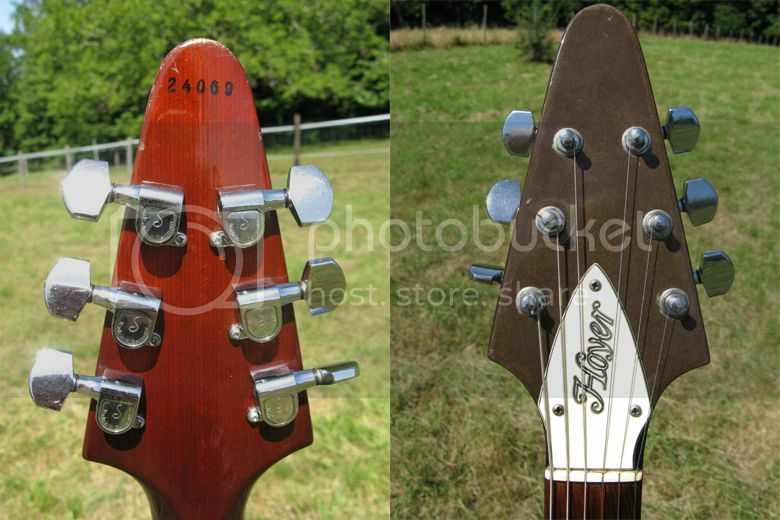 headstock finish? Looks like walnut, vice the bal. of the instrument. I would think the easiest way to address the sunken dot inlays is to simply find, fit, glue and lay over the existing ones. To chase those out with a drill looks like trouble. Got my '83 Tokai Silver Star back from the shop and the tech worked wonders w/ that lawsuit 70's style knock-off truss rod. I'll be able to go years before a full re-fretting is required. Apparently I had it all bodgered up trying to eliminate those buzzes. StewMac David, the dots are made of celluloid and have shrunk up over the years as they gas off the solvents used to manufacture them. You'll see this on any number of vintage instruments. When this happens we generally recommend leaving them alone as it adds to the vintage authenticity of the guitar. If you are determined to proceed with this repair we suggest first trying to see if they'll just pop out with a little leverage from an exacto knife or dental pick. When they shrink, the adhesive used to install them is compromised in the process and they often come out pretty easily. If they don't want to lift out, we recommend running a small amount of hot water under the inlay with a pipette to help soften the glue. You can then reset the inlays flush with the board using epoxy or a thick viscosity superglue. Another solution would be to inlay dots of thin rosewood veneer of the matching diameter under the sunken original dots making them level with the board. Again, we'd suggest leaving the vintage dots alone for the sake of originality though. Let us know if you still have questions. We'd be happy to help. StewMac would be the guys that know! Thanks for the research. My reservation is that while 21 of the 22 inlays will just 'pop out', the last one will be as good a bond as the day it left the factory! Life's just like that? OTOH I question the appeal of sunken inlays. Aside from attracting grit and dust it may affect playability and string wear patterns. Seldom easy answers when it comes to guitar.